Imagine a piezo-pickup so advanced you wouldn‘t even need a preamp. Imagine a piezo sound so rich and powerful its signal could be fed into an amp unprocessed. Imagine an electric guitar live sounding better than your favourite acoustic. The world‘s most advanced, most musical, most comfortable, most durable and most trouble-free piezo-bridge ever to play your song. Countless days and nights were spent learning, testing, building, abandoning and rebuilding until we found what we believe is a true and honest breakthrough. 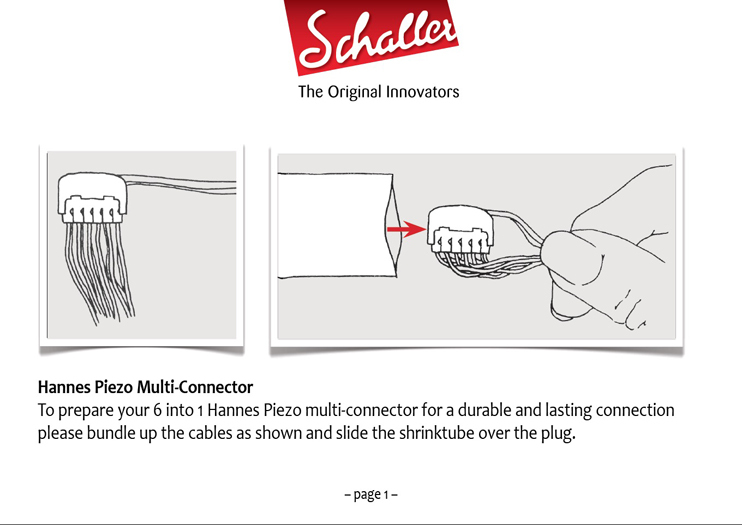 We invite you to listen to Schaller‘s Hannes Piezo playing your song. And now imagine the Hannes Piezo along with our new and groundbreaking FlagShip preamp! Your acoustic guitar can`t sound better! 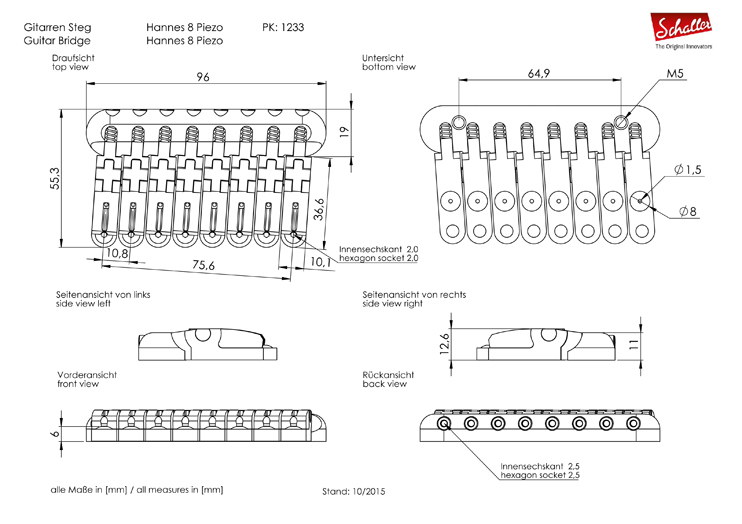 Unlike metalbased piezo systems and the widely known problems they are plagued with the Schaller Hannes Piezo bridge is constructed differently - and for good reasons. The piezo is installed deep into the saddle unit from underneath. Since neither string nor strumming hand gets in contact with the piezo mechanical wear and tear is never going to be an issue. Each individual piezo it is hermetically sealed in its slot. Since sweat and moisture will never get in touch with the piezo crystal the system withstands the common threats of moisture i.e. corrosion and short circuit. All this guaranteeing unlimited playing performance and consistent tonal excellence. compatible and ready to rock with all common piezo preamps on the market. But even by itself the Hannes Piezo delivers a signal so strong, clear and musical it can be fed directly into an amp or a PA without compromising its signal fidelity. 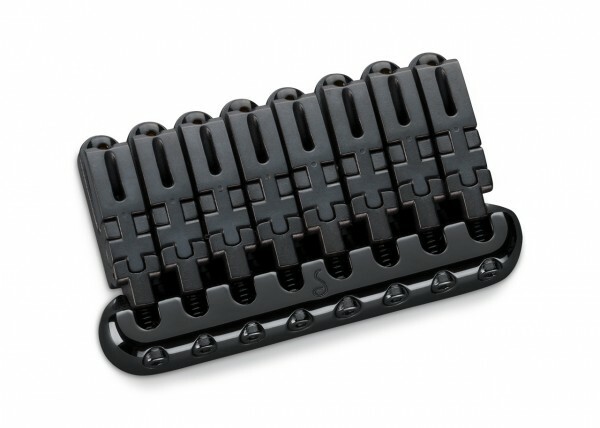 We deliver our Hannes Piezo bridge with a cable length of 200mm and a multi-connector with a cable-length of 150mm. Fundamental research in the field of piezo electronics brought Schaller‘s Hannes bridge into the spotlight. Painstaking testing proved the unique bridge construction and materials to be the superior basis to start from. Schaller‘s profound and longtime expertise in the field of piezo-technology became the foundation of a new generation of piezo-bridges. The use of cutting-edge piezo-elements and sealing-compounds – researched, developed and produced in Germany – result in a durable, yet ultra-sensitive bridge design. Next was milling, soldering and installing in unprecedented accuracy „where micrometers make the tone“. Hermetically sealed piezo-elements proved to deliver long trouble-free use and abuse and helped to avoid erratic dynamics so widely associated with piezo-pickup technology. As with the Hannes bridge itself Schaller‘s motto is sleek design and unobtrusive technology. Therefor the piezo-elements were invisibly installed into the saddles rather than on their top. Due to all these measures the Hannes Piezo delivers a warmth and complexity that trumps other concepts, particularily those embedded in metal components. Once finished every bridge has to pass Schaller‘s multi-level quality control before finally being played by a professional musician to ensure superior technical standards along with true and flawless musical performance. A perfect match with the FlagShip preamp the Hannes Piezo unfolds its full potential when combined with the advanced switching combinations of piezo and magnetic sounds. 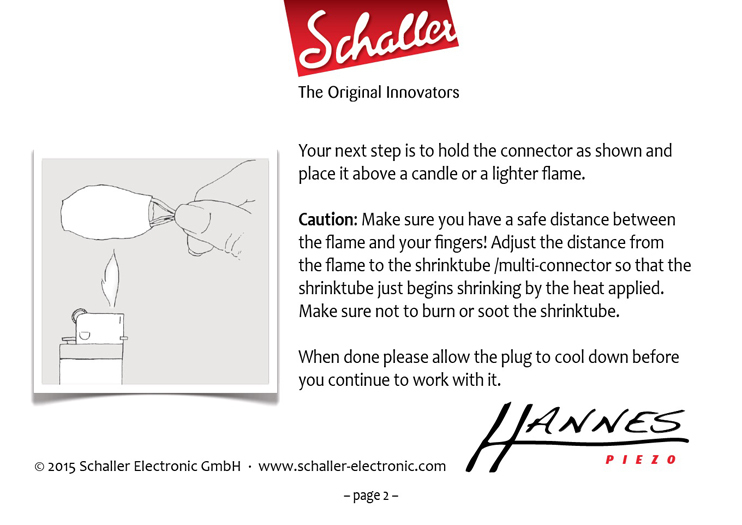 Please find our installation guide with all information in detail under Operating Instructions/Hannes-Bridge.